We are also working with Metrolinx to re-examine the P-gate arrangement at the crossing to see if further improvements can be made at this location. Pavement markings will also be added to the trail in both directions leading up to the new Belleville Underpass, to alert riders to the tunnel and slight trail curve. The new signs in the Lower Don Trail represent the first deployment of the new Parks and Trails Wayfinding system. Comments related to the new signs have been forwarded to project managers, who are evaluating this pilot phase over the winter. You can send additional comments to parkwayfinding@toronto.ca. A new accessible ramp will connect the Riverdale footbridge to the trail below. Staff is in the final stages of completing design and feasibility studies on such issues as floodplain hydrology with our partners at Toronto and Region Conservation Authority. We’ll be providing project updates on our other communications platforms, see below. Design work has been completed and tender documents prepared. Construction is currently not funded, though staff is working on securing funding for this important work. Announcements, including timing, will be made on our other platforms. Sorry, we do not have a proposed Phase 2 construction schedule at this time, but we are working on it. We anticipate updates to this blog with general information on Phase 2 timelines by spring. Creating better detour options and more robust communications around those options and around project progress. The Lower Don Trail is located in an active floodplain and conditions change. Please report any flooding or maintenance issues, including vandalism, to 311. You can call 311, email 311@toronto.ca or tweet @311toronto. 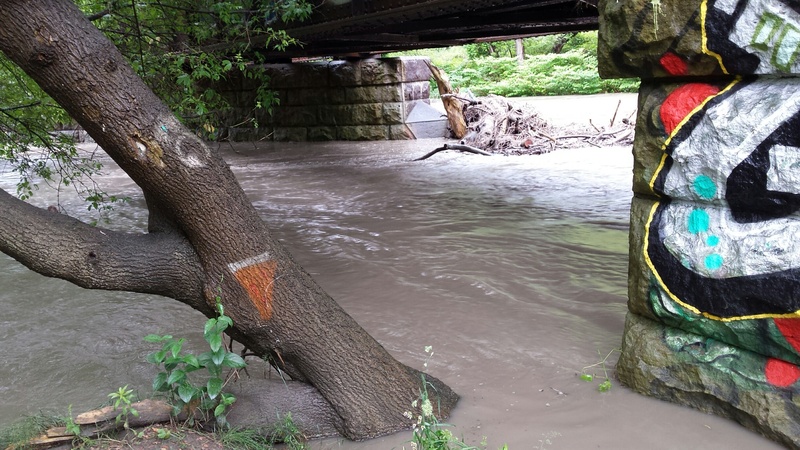 Toronto and Region Conservation Authority issues flood alerts. Visit https://trca.ca/floods/ for current conditions and alerts. There are many other ways to stay in touch with us. If you subscribed to this blog and supplied your email address, you’ll receive Phase 2 updates. You can opt out at any time. Follow us on Twitter and Facebook to receive Lower Don Trail project and programming updates, along with news about the new Council-approved Ravine Strategy and other news from Parks, Forestry and Recreation. You can call 311 with specific inquiries or concerns. Lower Don Trail is Open! After (way too many) months of a frustrating trail closure, the City is happy to announce the Lower Don Trail is now open again for your enjoyment and travel! The section of the Lower Don Trail that was closed was south of Pottery Road to Riverdale Park Bridge. You can now bike, walk, run, and roll through this section and continue on north and south. 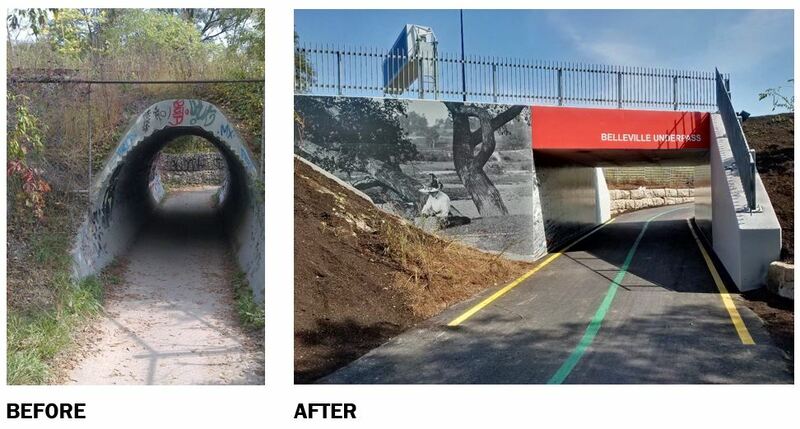 Below is a gallery of photos of some of the completed upgrades, including the new Pottery Road trail bridge, Belleville rail underpass, Bayview multiuse connection, and new signs, art, seating , and surface repairs. Thank you, to everyone, for your patience as we completed this work. Join us on September 23, from 10 a.m. to 4 p.m. to celebrate! Ravine Days events on the Lower Don will include food, games, activities, and music at three stops: the Cloverleaf, Riverdale Park East, and the Don Landing. Bring yoga mats for free yoga at Riverdale. Final paving of affected trail segments, especially at Pottery Road and the Belleville Underpass, is scheduled to take place the week of September 18. This section of the trail is currently closed and will be used by heavy equipment during this time. Please stay off the closed portion of the trail, between Riverdale footbridge and Pottery Road, until the reopening on September 23. Paid-duty police officers will be on site to control access. Pottery Road: Landscaping, including new post-and-rail fencing and new plantings, is in place prior to final paving of the trail connecting the Lower Don Trail over the new Pottery Road bridge to the Bayview Multi-Use Trail. Belleville Underpass: Works crews complete final grading before landscaping and paving of this section of the Lower Don Trail. It tunnels under the currently inactive rail line at the new Belleville Underpass. This section of the trail is closed and being used by heavy equipment until September 23. New trail signage as part of the Parks and Trails Wayfinding Pilot. On September 23, from 10 a.m. to 4 p.m., Ravine Days events on the Lower Don will include food, games, activities, and music at three stops: the Cloverleaf, Riverdale Park East, and the Don Landing. Bring yoga mats for free yoga at Riverdale. All Ravine Day activities are listed at toronto.ca/ravines. Ravine Days will coincide with the presentation of the Ravine Strategy to City Council’s Executive Committee for approval on September 26, and subsequently to City Council on October 2-4. The final strategy will build on the draft principles that were released for public feedback in June 2016, and will provide a framework for collaboration between City divisions and agencies moving forward. Thank you again for your patience as we worked through many issues during construction to arrive at this important moment in the history of the Lower Don Trail. We hope to see you September 23 and onwards. Enjoy the trail! Key Message: Trail will open soon, pending 3rd party utility re-location. Final construction work will continue into September. I understand your frustration on this project. We are working to get this trail open as soon as possible. When we reopen, the safety of this trail, its surfaces, connection to the Bayview multi-use trail and the visitor experience will be greatly improved, but I realize it is hard to take comfort in these improvements while the trail remains closed. Currently, we are waiting for a third-party utility that runs across the trail to be relocated so that final grades are acceptable for cyclists and do not impose a hazard. While this relocation is not the last of the work to be done, we expect that the trail will open after this work is completed. Additional safety protocols will be established to allow the final construction work to be completed while the trail remains open. The Lower Don Trail is a major spine in the utility infrastructure of this city. Three high-pressure oil pipelines, a gas line, as well as a major high-speed fibre optic line are all hidden in the trail alignment. On top of this is the visible utility infrastructure of electrical corridors and two rail corridors, all sandwiched within this green oasis of a recreational trail. As a result, there is very little working room between the rail, Don Valley Parkway and the river. Unusual high water and heavy rain this season has also affected the productivity of crews working in tight proximity to the river. Water levels of the Lower Don overflowed the banks in several areas of the project more than once this year, causing flooding in our work areas. I do want to clarify the status on the permits required and the timing of the applications. The City consulted with both Metrolinx and the Toronto and Region Conservation Authority (TRCA) about requirements and permits through the design process beginning in 2014. TRCA permits were completed in one step. Metrolinx requires permits be completed in a sequential process for each stage of work, as each stage is completed. Each submission takes several weeks to review and process and some of these permits have required several submissions. The most recent permit is a final re-submission for the last of 15 Metrolinx permits, which includes those needed by third-party utilities to relocate within the corridor as part of the project as well. This is the process for all Metrolinx permits for these types of projects. There have been lessons learned in the permit review and approval process that will be applied to the next stage of Lower Don work, and indeed all future trail work. Also, I am working with staff to improve how we plan and communicate trail detours to reduce the effect on trail users. This work includes ensuring contractors are better able to safely maintain, to the fullest extent possible, public access to trails and public facilities during construction. We look forward to the reopening and we hope you will attend the formal celebration of the improved trail later in the fall. 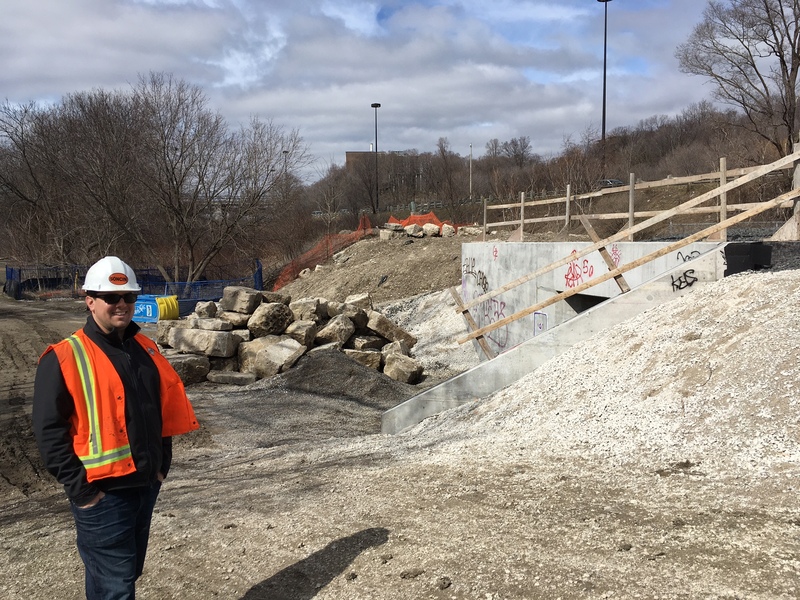 The City is in the final stages of work to reopen the improved section of Lower Don Trail between Pottery Road and the Riverdale Parks Bridge. Record rainfall has caused intermittent flooding, slowing progress. Here, contractors inspect the completed Belleville trail underpass structure. Tracks Removed: The rail bed on top of the Underpass, before laying the new track ballast and rails. Tracks Replaced: City contractors have replaced the rail line above the Belleville underpass and largely completed the earthworks around the new structure. Rising water levels in the adjacent Don River from record rainfalls have challenged construction work. Higher than normal rainfalls causing flooding have delayed some work. Assuming enough favourable weather and permit approvals from our partners, we are optimistic the trail can be safely reopened in July. Stay tuned to this blog for announcements. Until the trail is opened, please do not trespass past the fences. Along with construction area dangers, there has been flooding in this section of trail, as there have been extreme weather events, with water levels far above normal for this time of year. Thank you again for your ongoing patience. With above zero temperatures now the norm, construction crews will be returning to the work site on the Lower Don Trail next week. To facilitate the construction traffic in a safe manner, the section of trail between Pottery Road and Riverdale Park Bridge will remain closed until July 2017. For trail users looking to connect to the trail north or south of the closure, the recommended detour remains via Broadview Avenue (view detour map). We apologize for this extreme ongoing inconvenience, but unfortunately the contractors and City project team were previously overly optimistic with the date for re-opening the trail in the spring. City staff have pressed for the trail to be reopened as soon as possible, but with public safety concerns on site, July remains the projected date for reopening. On the positive side, major works have been accomplished, such as the installation of the trail bridge at Pottery Road, and more recently the main concrete work for the Belleville Rail Underpass tunnel. The next tasks will include large amounts of soil movement for grading and drainage works. After this, crews will be planting, repairing sections of trail, paving, top soil placement, grading and seeding. The City is also looking forward to required works by Metrolinx related to their rail crossing, to allow for the connection of the trail across the new Pottery Road bridge to the new Bayview multi-use trail to Rosedale Valley Road. We can’t wait to post an update this summer celebrating the opening of this much improved section of the Toronto’s fantastic ravine trail network. Thank you again for your patience. Unfortunately Lower Don Trail will remain closed between Pottery Road and Riverdale Park Bridge in to spring 2017. This extended closure is caused by unforeseen underground site conditions and challenges with 3rd party existing infrastructure in the work zone. Heavy concrete trucks are travelling in the work area now. Please respect the trail closure that is in place for your own safety. See recommend detour route map via Broadview Ave below or at this link . The new Bayview Ave multi-use trail is now passable from Pottery Road to Rosedale Valley Road, which makes a good alternate route connecting west to the Brick Works, The Beltline Trail or into the city. The project team has been hard at work on the Belleville Rail Underpass portion of the project. Sub-grade works have been complete with the placement of the final caisson and the advancement to the structure works. The footing concrete and associated rebar have been placed with our crews working on forming the accompanying wingwalls and retaining walls. At the Pottery Road segment of work, contractors have been excavating and grading the pathway connection from Bayview to the new Pottery Structure. They are coordinating with the railway to create an appropriate at-grade crossing plan. Please note the new trail bridge is not yet open. Please be reminded that construction activities and the associated truck traffic pose a risk to the public. We have to stress that all parties respect the trail closure that is in place as it is for the safety of the public. Unfortunately, it has been observed that some individuals choose to disregard the signage, fencing, site personnel and closure. The act of disregarding this closure can pose a risk not only to yourself but to others as well. See recommend detour route map via Broadview Ave below. Bayview Multi-use trail is also now passable from Pottery Road to Rosedale Valley Rd. Pottery Road is open again to vehicles and pedestrians ahead of schedule following the successful installation of the new trail bridge on Saturday. Thanks to some professional crane operators, great project team work, and follow through on commitments by Mother Nature, the new pedestrian-cycling bridge is now in place and the weekend construction area closures have been removed. Thank you, trail users and motorists, for your patience. Trail users can again connect to the Lower Don Trail north of Pottery Road to Beechwood and also to the trails in Crothers Woods. 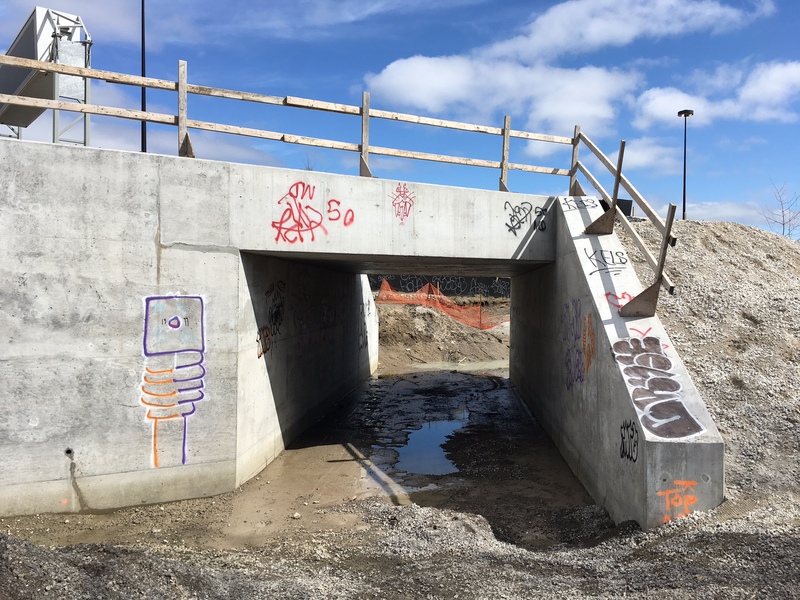 Sorry, but the Lower Don Trail, south of Pottery Road, will remain closed in to late fall for the challenging construction of the Belleville Underpass. The new Pottery Road bridge itself will not be open until connecting pathways are completed – stay tuned to this blog! We hope you all have a delightful Sunday! This weekend, Pottery Road is closed and the Lower Don Trail is closed to and from Pottery Road going north and south. That means no trail access south of Beechwood Drive/Don Mills through to Riverdale Park. Please avoid this area. Access from the trails in Crothers Woods to and from Pottery Road will also be closed. The Pottery Road new pedestrian/cycling bridge is being placed the weekend of August 27-28! It will connect the new Bayview Avenue multi-use trail, now under construction, to the Lower Don Trail as part of Lower Don Trail improvements. Pottery Road between Bayview Avenue and Broadview Avenue will be closed to all through traffic the weekend of August 27-28, beginning 6 a.m. Saturday. Local access only to Fantasy Farms and Todmorden Mills will be maintained from Broadview Avenue. Cyclists coming down Pottery Road from Broadview will not be able to connect to the Lower Don Trail. Same goes for pedestrians, skateboarders, incline skates, and uni-cyclists. Sorry. The trail will be closed south of Beechwood Drive/Don Mills. Any trail user arriving at Pottery Road will be turned back up the trail. There is no exit during construction. This portion of the trail is already closed, from Pottery to Riverdale Park, for continuing work on the new Belleville Underpass tunnel. The trail will be closed at the top of the hill leading down to Pottery Road. Any trail users arriving at Pottery Road will be turned back up the trail. There is no exit during construction. Unfortunately the closure on Lower Don Trail, south of Pottery Road, will be extended in to late fall. The complications in constructing the Belleville Underpass tunnel continue to be a serious challenge for our construction contractors. I know, this is really frustrating and annoying. Enter your email address to receive notifications of trail closures and other project updates. charlesdoliver on Lower Don Trail is Open!